Earth Day is coming soon, and Staples has a promotional deal that's bound to appeal to our green side-in more ways than one. The office-supplies retailer is offering free printer recycling and a $50 rebate with the purchase of a new printer that retails for $179 and up. The deal is valid at all of Staples' 1,500 U.S. stores and runs through May 2, 2009. Staples ran the same promotion last year and collected more than 100,000 printers. It hopes to gather even more this year, the company says. On Earth Day, April 22, Staples will offer free recycling of any tech gadget it sells, including phones, digital cameras, laptop computers, and GPS devices. The company normally charges a $10 recycling fee. The $50 rebate seems like a good deal, although I've had my issues with Staples rebates in the past. 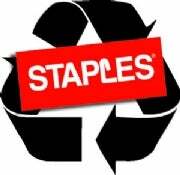 Last year I recycled a few ink jet cartridges there-Staples pays $3 per empty tank-and never received a dime for them. When I phoned Staples, the company said it had sent me a check, but added that the envelope resembles a promotional flyer. "A lot of people just throw them out," said the Staples rep. When I asked for a new check, the rep said the rebate period had already expired-so no check for me. Of course, rebate horror stories are nothing new, and plenty consumer advocates would like to see the often-shady deals go extinct. I'm still waiting for rebate checks from the last millennium.